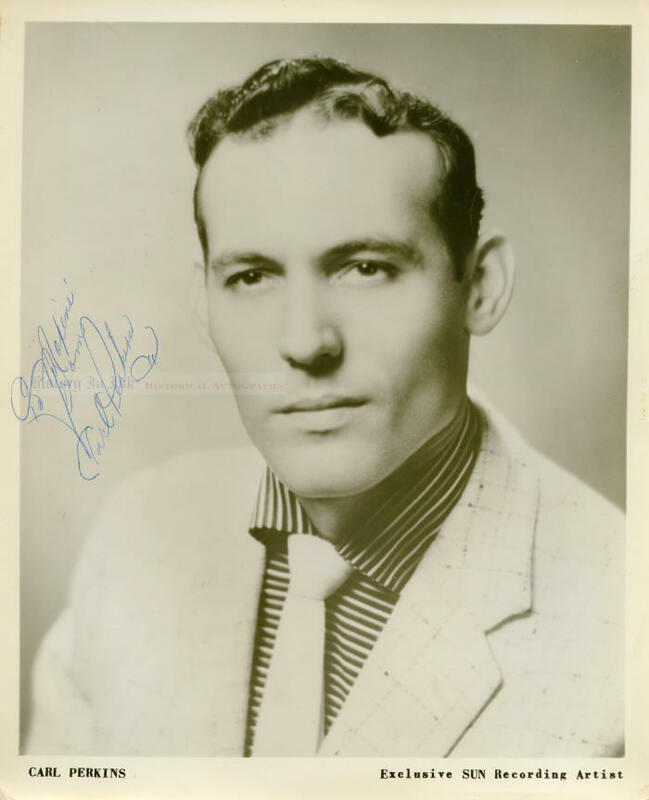 Carl Lee Perkins, 1932-1998. Country music performer and songwriter. Vintage glossy 8" x 10" photograph inscribed and signed To Maxine / from / Carl Perkins. This photo has never been on the autograph market before. It comes from a collection of vintage signed photographs of country music stars owned by the president of recording artist George Morgan's fan club in the mid-1950s. This black-and-white publicity photo was issued by Sun Records of Memphis, the home of the rockabilly style that swept the United States in the mid-1950s. Perkins was one of Sun's “Million Dollar Quartet,” which also included Elvis Presley, Jerry Lee Lewis, and Johnny Cash. This photo dates from the period between late 1954, when Perkins signed with Sun, and early 1958, when he moved to Columbia Records. It shows a pensive Perkins wearing a striped shirt, jacket, and necktie. 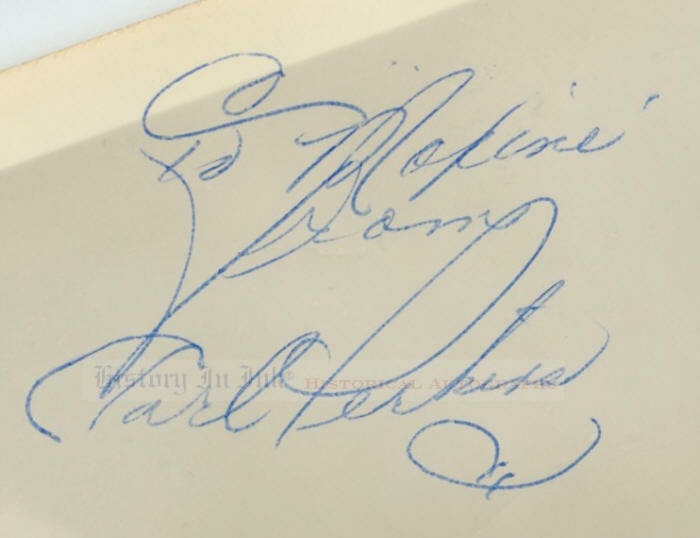 Perkins has inscribed and signed the photo in blue ballpoint in a blank area at the upper left. Perkins, the “Rockin' Guitar Man,” was one of the architects of rock and roll. Sun founder Sam Phillips said of him, "I knew that Carl could rock, and in fact he told me right from the start that he had been playing that music before Elvis came out on record. . . . I wanted to see whether this was someone who could revolutionize the country end of the business." He did. His smash hit Blue Suede Shoes, which he wrote after he saw a dancer get mad at his date for scuffing his shoes, became the anthem of rockabilly. A massive crossover hit when Sun released it in January 1956, it scored # 1 on Billboard's country music charts, # 2 on its Best Sellers pop chart, and # 3 on the rhythm and blues charts, and by mid-April it was the first Sun song to sell a million copies. Despite success, Perkins remained humble and self-effacing. “I felt out of place when Blue Suede Shoes was Number One,” he said. “I stood on the Steel Pier in 1956 in Atlantic City . . . and the Goodyear blimp flew over with my name in big lights. And I stood there and shook and actually cried. That should have been something that would elevate a guy to say, �Well, I've made it.' But it put fear in me." Sun Records released a number of other Perkins songs, including Gone, Gone, Gone, Boppin' the Blues, Dixie Fried, Everybody's Trying to Be My Baby, You Can't Make Love to Somebody, That Don't Move Me, and the rockabilly classic Matchbox. Perkins created a body of critically acclaimed works that influenced later singers, guitar players, and songwriters. The Beatles' George Harrison said that he taught himself to play guitar by copying Perkins's records. Artists such as Rick Nelson, Johnny Burnette, Patsy Cline, and the Beatles themselves recorded his songs. Cash's recording of Daddy Sang Bass, which Perkins wrote, was a # 1 hit in 1969. This photograph is in fine to very fine condition. It has as couple of minor surface creases and corner bends that do not detract from its overall excellence. Click here to see other American History items.